Designed to secure your entire cutting unit, the 1324 IIE is the original Saf-T-Cart. Its lockable cabinet allows regulators, torches and tips to become a part of the unit and secures them with a lockable door, eliminating the need to break down and reinstall the unit daily, saving you time and money. 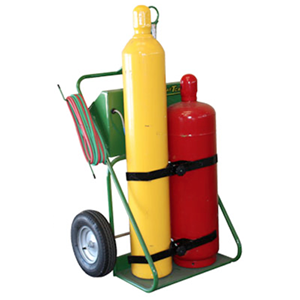 Comes standard with a lifting eye, permaclamps, pigtails, oxygen and fuel gas fittings. Also available with a firewall; just ask for the 1324 II-FW. The cabinet on the 1324 IIE is designed for easy set up. All you have to do is add the cutting outfit and regulators and you’re on your way.